Certified. 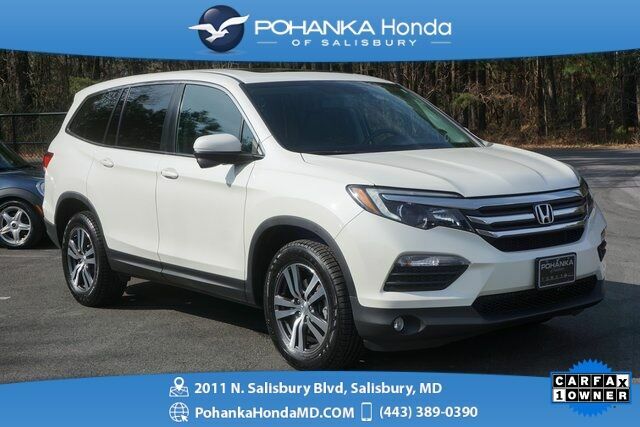 White Diamond Pearl 2017 Honda Pilot EX-L AWD NAV ** 1 Owner ** Honda Certified 7 Year/100,0 AWD AUTOMATIC 3.5L V6 24V SOHC i-VTEC ** MARYLAND STATE INSPECTED **, ** GUARANTEED FINANCING **, ** GUARANTEED LOWEST PRICING **, ** HONDA CERTIFIED **, ** CARFAX 1 OWNER **, NAVIGATION, SUNROOF, ALL WHEEL DRIVE, POWER SEAT, PUSH BUTTON START, POWER REAR LIFT GATE, HEATED LEATHER SEATS, LEATHER SEATS, REAR VIEW CAMERA, AWD, Navigation System. * A versatile, roomy interior with spacious rear seats; ride is smooth and compliant in most conditions; better fuel economy than rivals; multiple clever storage compartments. Source: EdmundsPrices exclude taxes, tags, and dealer processing fee of $300, not required by law. Remember your tax is always determined by where you live and not by where you buy at Pohanka of Salisbury.